Patitas is a young German Shepherd who was born with two underdeveloped limbs. Due to his condition he has never been able to properly walk. Even applying the slightest pressure causes him discomfort and there have been times where the bone presses against his skin so much that scabs form. Despite Patitas’ situation, he is very cheerful and energetic. We at K9 BioWalk have made it our mission to help Patitas to the best of our ability. To date we have created various working prototypes for him to use. According to the Patitas’ owners has been the most active he has ever been in his entire life when he is wearing our prosthetic. 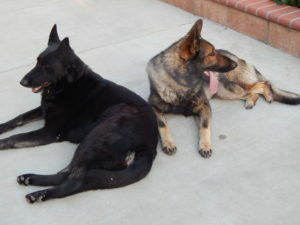 In the coming months we will be presenting Patitas with a final version of our device which will allow him to go on walks with his mother (the black German Shepherd pictured above) and play as much as he wants without any discomfort.